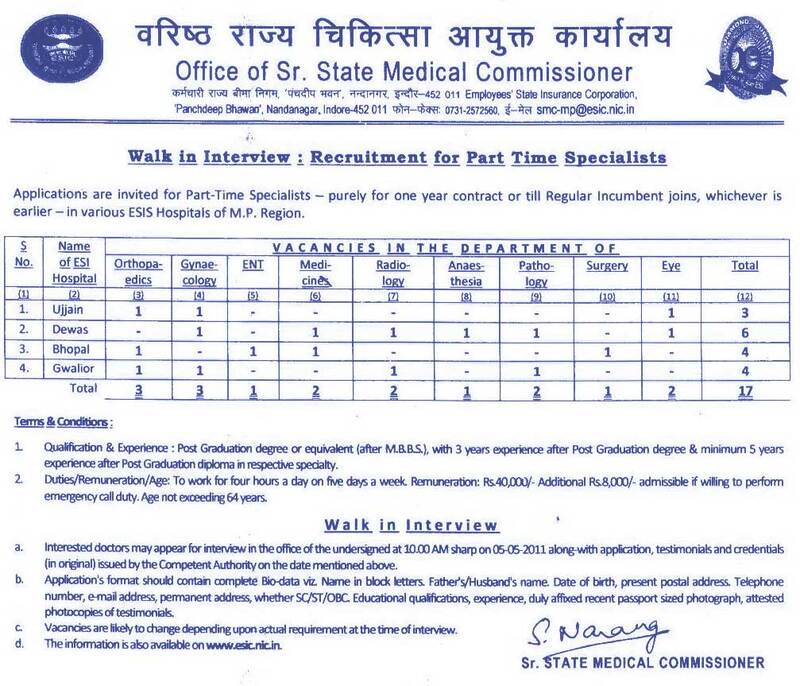 ESI Hospitals in Madhya Pradesh need Specialist Doctors in the following Specialities on part time basis to work at Ujjain, Dewas, Bhopal & Gwalior. Qualification & Experience: Post Graduation degree or equivalent (after M.B.aS), with 3 years experience after Post Graduation degree & minimum 5 years experience after Post Graduation diploma in respective specialty. Duties/Remuneration/Age: To work for four hours a day on five days a week. Remuneration: Rs40000/- PM Additional Rs. 1,000/- admissible if willing to perform emergency call duty. Age not exceeding 64 years. 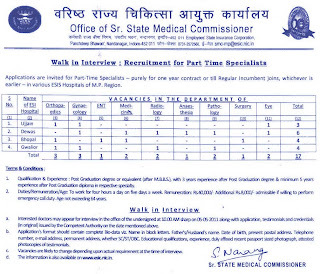 Interested doctors may appear for interview in the office of the undersigned at 10.00 AM sharp on (&05-2011 abng-with appfcation, testimonials and credentials (in original) issued by the Competent Authority on the date mentioned above.